Send an engineer of a high-tech company to a high-tech city, and what do you get? Pictures of temples. It seems it takes bright colors to make me pull out the camera when I’m jet lagged, and these temples provide the color. 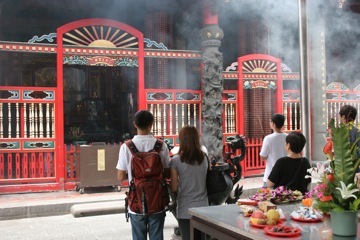 Longshan is one of the most famous temples in Taipei and always busy, while Qingshan is more quiet, with staff that has enough time on their hands to remind me repeatedly that there are three floors to see. Of course there’s more to see in Taipei. For the first time, I get to use the subway, and it works very well. Interesting are the plastic tokens that are used for single trips – they actually hide an RFID chip to record their value. Impressive also how travelers line up to the sides of the doors and let folks on the train get off first before boarding – that doesn’t work so well in many other places. Yangmingshan, the mountain north of the Taipei, provided a good hiking opportunity and some nice views of the city before we got enveloped first by clouds and later by sulphuric fumes. At the Shilin night market, we found some tasty food, even though we had to use a Japanese menu for lack of an English one (kana are easier to read than Chinese characters!). 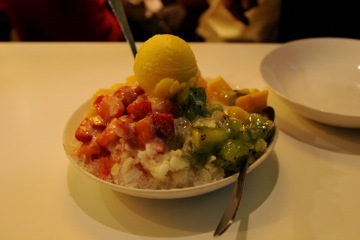 And of course we also tried the famous (and still good) dumplings at Din Tai Fung and the huge shaved ice with fruits at Ice Mönster, without which a visit to Taipei apparently cannot be considered complete. © 2003-2019 Norbert Lindenberg. All rights reserved.